Welcome to the Center for IT Excellence (CITE). The rapidly changing path of information technology is expanding the borders of how we learn, discover, and communicate. CITE is eager to provide the needs of the campus by ensuring the current technologies are in place and in working order. 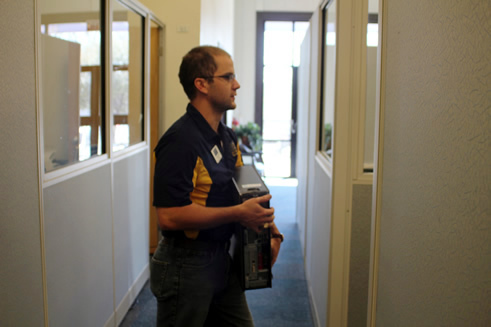 An expansive use of institutional technologies at A&M-Commerce is necessary to support campus operations. As A&M-Commerce commits to deliver its Mission, these technologies serve to deliver classroom instruction, support departmental functions, perform student business, promote community involvement and are utilized to meet internal and external reporting requirements. CITE manages the technologies to help Texas A&M University-Commerce improve the quality of education and research, prepare our students for work in the twenty-first century, expand its role in the community and around the world. Can We Help You With IT? Whether it concerns your network, email or MyLeo account, connecting to the internet, or hardware and software support CITE Help Desk or Call Center is available to provide assistance. After all, IT is what we do! CITE is pleased to offer services that will make technology life on campus easier, without having to visit or contact CITE. Its technology for technology's sake, placing IT right at your fingertips! There's a lot you can do to protect yourself and your computer from scammers, hackers, and identity thieves. Learn how to be Cyber Smart!